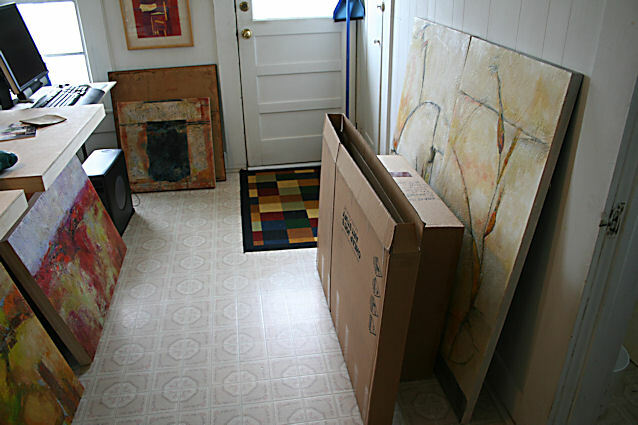 I was headed off to Mississippi Art Colony right after returning home from the opening of the show at the Encaustic Center in Richardson, TX. …….SO no time to finish up the final touches. It did take very little to finish this painting. I am thankful to the powers that be that I could do so much in such a short time to make a painting I am happy with. Here’s the link again to the video…… 37 minutes so be prepared. 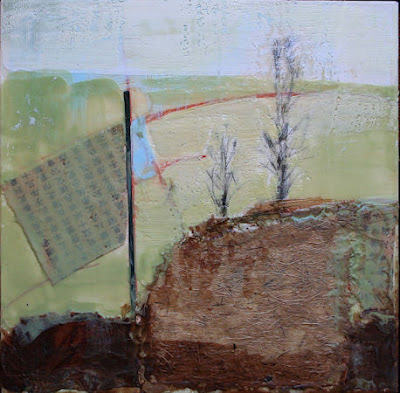 Here is the completed 12 x 12 x 2″ wood panel encaustic/collage painting I titled Overlook. This is a large file so I hope most people can see it. You will have to have a good connection as it is 37 minutes long. 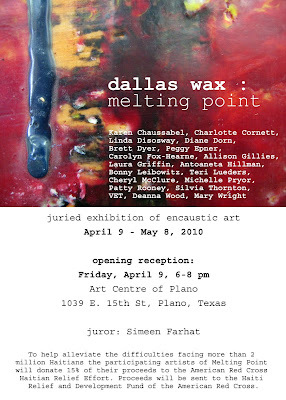 Peggy Epner and I both did short videos at our opening reception at the Encaustic Center in Richardson, TX April 16, 2010. This is an unedited video of my demo. Peggy and Cheryl will be doing a demo on their intriguing techniques at 7:00 and 7:45! We so look forward to having you here for an evening of art, food, wine and music! Throughout human history, there have been cultures that have regarded trees as having spirits. It is not difficult to imagine why. Trees live, grow, adapt, and die, subject to the same forces of nature that rule humans. On a cellular level, humans and trees are made up of the same essential ingredients. We come from the same source, whatever you believe that to be. My work assumes an interconnectedness of the world’s life forms, particularly of man to the forest. Throughout my life, I have played, explored, and slept in the forest. It always feels like coming home. It is a spiritual connection that goes to the root of who I am as an artist and a person. In my evolving visual vocabulary, wood and reference to trees have come to represent the bodies, spirits, and intentions of people. Sometimes mine. Sometimes yours. Sometimes everyone’s. Does it really matter? It is all the same. I have always been influenced by nature and the land. Living on a ranch in northeastern Texas for the past two years has moved that influence up a notch. I am surrounded by trees, pasture lands, sky, pond and a meandering creek. Looking out my windows in the house or the studio is such a pleasure…even in bad weather; I find something I never noticed before. With all this said, I don’t set out to paint what I actually see in nature. It just comes through as I work through my process. Whether in acrylic painting or the wonderful encaustic medium, I strive to let the painting speak to me. I make revisions when I see that is where the painting is going. I have a conversation with the paint and the process. Without a social or political message, surface quality, color relationships and design are what I am most interested in when painting. I’ve been busy in the studio all day with putting on all the hangers, wire, polishing, cleaning edges and finding boxes or not for work that is going to a show in Plano (see previous post on the Art Centre of Plano). tomorrow. I confess, most of the cleaning of edges and wiring is for my two person show with Peggy Epner at the Encaustic Center than opens Friday. I’ll post more later on that. I hate putting off stuff like wiring panels/canvas but it’s one of those things I do. 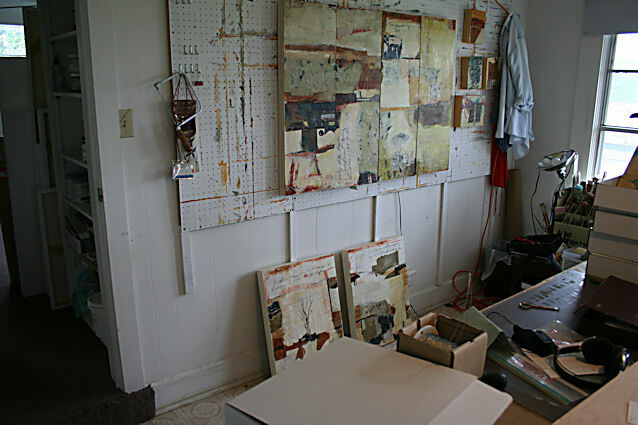 It’s especially bad if you have a lot of them to do at one time and your studio is so cluttered you hardly have room to work. 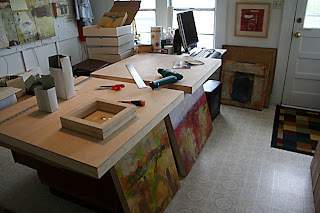 I still don’t have a good box for two 24 x 48″ panels with encaustic so I just put glassine on the fronts of them, topped the top and bottom of each panel with bubble…and wrapped all that clingy wrap around each end hoping they won’t move and cause any damage. If I ever ship this painting off anywhere I will have to have boxes custom made. In the meantime, they will go like this. The work table is so crowded my two new 30 x 30 panels are still there from when I put them together last week. SO, I just worked on top of them. I won’t show you what the other two rooms look like…disasterville! In these photos I have a one piece I hope will get in a show soon and I’ll be very happy to get the notice when ever it comes. All the rest are going to The Encaustic Center or the Plano show. 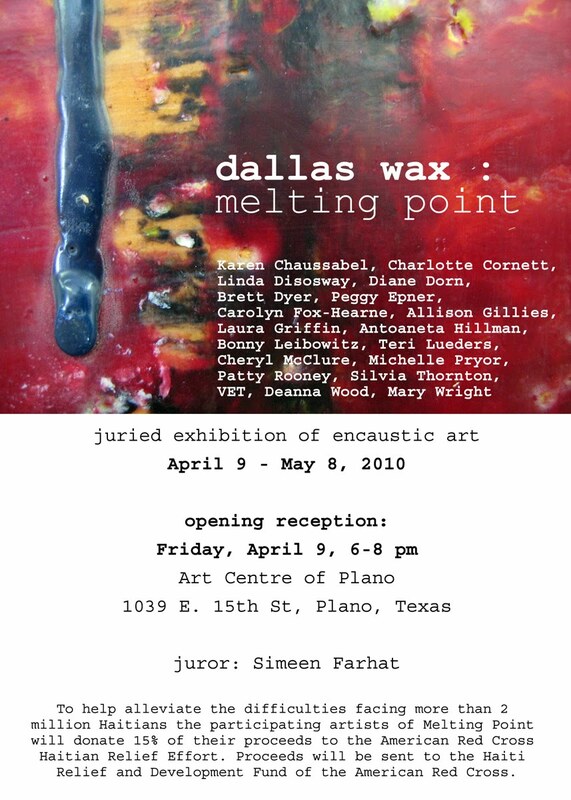 Texas Wax – Dallas has a new juried exhibit opening at the Art Centre of Plano, April 9.. 6-8pm. Come by if you are in the area that evening. If not, the show will be up until May 8. Fifteen percent of sales from this exhibit will go to the Red Cross for Haitian relief. Come out, buy a painting and do something good for Haiti all at the same time. I will have three encaustic paintings included in the exhibit…..among them, Almost Winter, a 48 x 48′ diptych on wood panel.